CRM user adoption is a challenge even for the best of managers and their teams. Slow and low user adoption are the primary reasons CRM engagement fails to achieve its full potential. According to a Merkle Group Inc. survey, around 63% of CRM initiatives fail in large organizations. A scary number to say the least, which can make you wonder whether CRM will be a success for your organization. But, the silver lining in the survey was the finding that those who had successfully implemented CRM were satisfied/happy with the benefits and value it provided to their organization. The absence of ownership of the project and customer insights. The absence of management insight and executive involvement. Lack of user adoption after the CRM gets implemented. CRM initiative not getting adequate priority by the IT staff. According to a Forrester research survey, the challenge that separates a successful implementation of CRM from an unsuccessful one is the issues that relate to people. People issues in CRM implementation fall into three main categories. Leading the pack is slow user adoption (49%), followed by insufficient change management and training (35%) and aligning to new ways of working (15%). These issues confirm that change is the biggest barrier when it comes to implementing new technologies like CRM. Also, a CRM system is known to track all information, which makes people nervous that senior management will use it to monitor their activities and productivity. How to increase CRM user adoption? When it comes to CRM end-user adoption, you have to understand that it is less about technology and more about changing the behavior of those who have to use the system. It means that you have to carefully select the people who manage and lead the CRM implementation program for your organization. Make sure that there is a strategy in place – Before you embark on the journey of implementation, make sure you have a sound CRM strategy in place. The strategy should have a clear roadmap, vision and plan that lists the building blocks of the path ahead for the employees of the organization in conjunction with the new CRM system. The strategy should include how it will support your organization’s overall business strategy. Also, you should have clear, well-defined, but achievable objectives, as well as perform a detailed assessment of what is expected of the employees and management to achieve the end business result. If you don’t have a clear-cut strategy, it becomes difficult to convince the end-user that the organization is serious about implementing the CRM project. And, when you make your employees understand that the CRM software is directly linked to the core objectives of the organization – customers, sales and revenue – they are bound to take the project seriously and adapt to it. Form the right team – This is a crucial one. Make sure you have the right people on board when it comes to CRM implementation. After all, it will be the responsibility of the project team to see to it that user adoption takes place properly. It should be a balanced mix of people who understand technology and those who can manage people and implement your company’s core objective of adopting a successful CRM solution. Make sure the users are involved from the start – Ultimately, your employees are the end-users who have to adopt the system, so they should know from the start what’s in store for them. Identify the stakeholders from each team and make sure you involve them in the CRM software selection process and in the pre-implementation analysis to provide ownership of the project. Also, take into consideration the opinions of your employees, and try to dispel all the myths and/or apprehensions that surround the CRM and its implementation process. Convince the employees that the CRM solution will only benefit them and improve their performance – and that it is not a tool used for keeping tabs on their activities. Address their doubts and provide support so they can give their one-hundred percent to make the project a success. Improve your business processes – CRM software deployment gets a boost when you improve your business processes, resulting in higher user adoption and return. The dual impact of business process improvement with technology results in easier-to-use processes, enhanced employee productivity, lower operating costs, minimal errors, quick transaction cycles and improved overall return on your technology investment. Get a system that is easy to use – Make sure that the CRM solution is customized so that it reflects the way your users work and not vice versa. An easy-to-use interface result in better user adoption. Emphasize employee training – User training is vital to the success of CRM adoption and utilization. You can create specific training modules for different business processes to familiarize employees with the overall functioning of the CRM. For example, a salesperson should know how to follow a sales process and make a sale, while a marketing person needs to learn how to register leads and follow up with them. Make sure that the administrators get extensive training so that they are well-equipped to handle employee queries. The administrators should also be well-versed in configuring the system and other administrator-related work. There are many features in a CRM system, and it is practically impossible to learn all of them in one single session. Break your training into short and frequent sessions so your employees can more easily process the information. Put a change management plan in place – Change management prepares your employees and organization to adopt change without compromising productivity. There are employees in every organization who resist change because it makes them move out of their comfort zone. These employees at times can influence others who are ready to embrace the change, which will stall your end-user adoption. A change management plan can alleviate doubts and bring everyone on board. Reward the users who perform well on the CRM system – Devise a strategy that rewards those who utilize the CRM system well. You can do this by measuring the adoption level of the employees – namely by gauging their productivity and utilization, not by merely logging into the system. Rewarding employees is a great way to drive home the point that the organization is serious about CRM implementation. 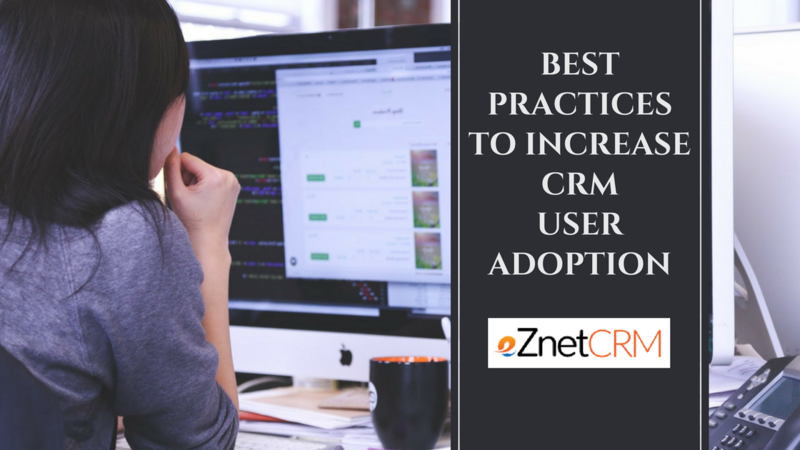 Following these best practices can help increase your chances of successful CRM user adoption. If you are considering a CRM solution, eZnet CRM offers an intuitive, user-friendly system that is easy for employers to implement and for employees to use. eZnet CRM provides the comprehensive support, training and technical capability critical to seamless functionality and end-user acceptance. Contact us to learn more.